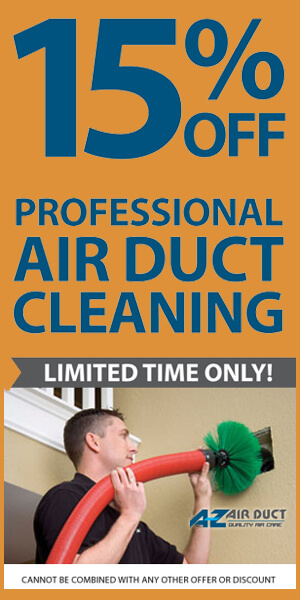 Have the BEST AIR DUCT CLEANING company in the valley professionally clean your home’s air ducts…and NOW you enjoy 15% OFF this great service! People used to move to Arizona to find allergy relief. We have found, however, that allergies are as much of a problem as anything else these days, and Arizona is no longer the allergy­free oasis of the past. Are you dusting more than usual? Do you smell anything unusual when you turn on your HVAC system? If you answered “yes” to any of these questions, you may have a dust problem in the air ducts of your home. A­-Z Air Duct provides solutions, leading you to a much cleaner home where you can breathe and rest easily, knowing your home is cleansed of dust and pollution. A­-Z Air Duct is a Professional, Family Owned and Operated Air Duct Cleaning company serving Phoenix and all surrounding cities. Call us at 602­-466-­2234 for a Fast Response! 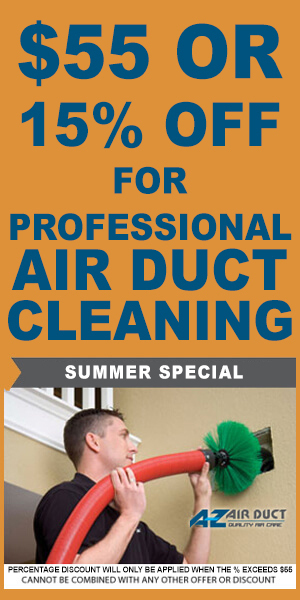 We are available for your Air Duct Cleaning, Dryer Vent Cleaning or Home Inspection, to help you save money today. We also work with many residential and commercial contractors, to get you the best quality service possible.